The unmentionables are back, and this time it’s up to you to put them back in their graves! 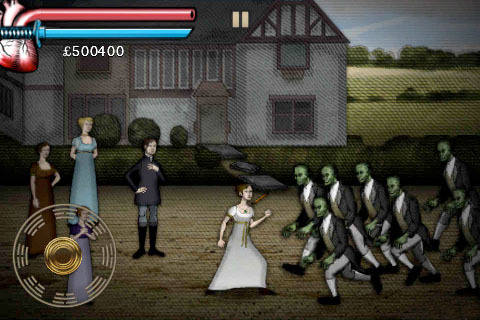 If you couldn’t get enough Pride and Prejudice and Zombies from the novel, do yourself a favor and check out the video-game adaptation by Freeverse, Inc. Yes, you actually get to play a katana-toting Lizzy as she traverses the English countryside, stately mansions, and trials of romance in a world beset by the unmentionables. Become a zombie-slaying machine, learning new combat techniques, and find out just what that Darcy guy’s problem is! P&P&Z: The Game is available on iPhone, iPod Touch, iPad, or any other iThingy with access to the App Store. The game is broken down into twelve chapters and an epilogue that follow the main points of the novel. You don’t need to have read the novel, as each chapter is introduced with text directly from the book and beautiful anime-style character graphics. The game retains the atmosphere and quirkiness of the novel, even down to the double entendres regarding everyone’s favorite social event. Freeverse has also done an amazing job of bringing this tale to life in terms of graphics and music selection. One warning: all that gore that was left to your imagination sprays across the screen. Luckily, it’s in a cartoonish fashion with blood and limbs literally flying across the battlegrounds as Lizzy slaughters the undead and anything else that gets in her way. The controls of the game are smooth and fluid. An on-screen directional pad controls movement. The basic attack is just a tap on the nearest enemy. More advanced attacks are incorporated through swiping the screen in any of the eight directions. These advanced tactics can be strung together to form devastating combos, leaving the ruins of your enemies scattered in your wake. It becomes quite addicting in later levels as Lizzy cuts down larger groups of enemies with a few flicks of your finger. Onscreen, you have a health meter that is depleted as you are damaged by the unmentionables. Below this is a technique meter that depletes as you use more advanced and damaging martial-arts maneuvers to eliminate hordes of the undead. Throughout the levels are powerups that replenish your health, while technique regenerates over time. As you slay your way through each chapter, you’ll earn cash that you can use to upgrade your techniques, making them more powerful. In addition, you are rated at the end of each chapter in three categories: the speed with which you complete the level, the amount of Lizzy’s health remaining, and the number of techniques you use to defeat your opponents (style). You receive an overall rating of Silver, Gold, or Platinum Warrior based on your performance. As you beat each level, that level becomes unlocked so that you can play it again in an attempt to increase your ranking. Freeverse has teamed with Plus+; an online social gaming network aimed at the iPhone, iPod Touch, and iPad. You have the option to create an account and upload your high scores on P&P&Z: The Game through the Plus+ leaderboards, if you choose. This game is just a great deal of fun. Some parts are challenging, but if you’re at least a casual gamer, you’ll pick up the controls in no time and be hacking your way through the unmentionables. It’s also a funny game. Without giving anything away, there were at least two times that I had to pause the game because I was laughing too hard to play. I appreciate a game that can maintain a sense of humor the whole way through. The one complaint that I have with P&P&Z: The Game, is that it’s too short. It can be beaten in a day or less and the techniques are maxed out all too quickly. Each level can be replayed, but with nothing to spend all that money on, it loses its luster quickly. On the other hand, it’s an iPhone game, not a console or PC title. I should be happy with what I got. It’s great for a break or a time killer, and I can at least hope for some new downloadable missions. For $2.99 you really can’t go wrong with this game…unless you hate the book, or zombies, or ninjas, or ladies in period costume bearing samurai swords. Seriously, what’s not to like? Douglas is a horror author and freelance writer in the video-games industry. For some odd reason, he frequently finds himself surrounded by Jane Austen experts. 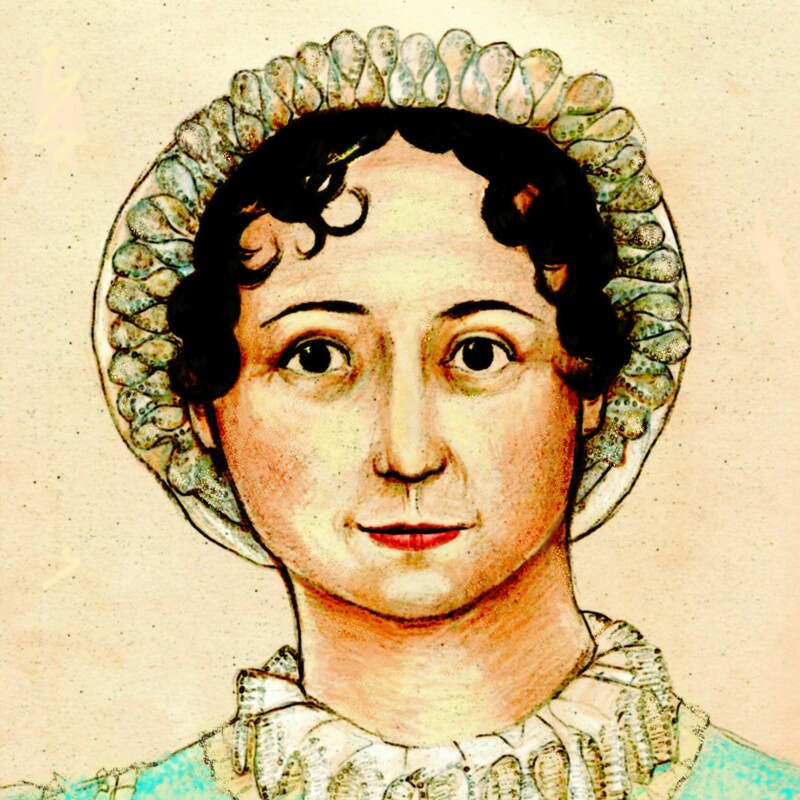 Surrounded by Jane Austen experts? Where does he live? Chawton Library? Thanks for the review! Sounds like it’d be fun to get. BTW – I don’t know when you changed the theme, but I like it a lot. For $2.99 even this thrifty person will try the game! I wish I had an iphone so i could play it!